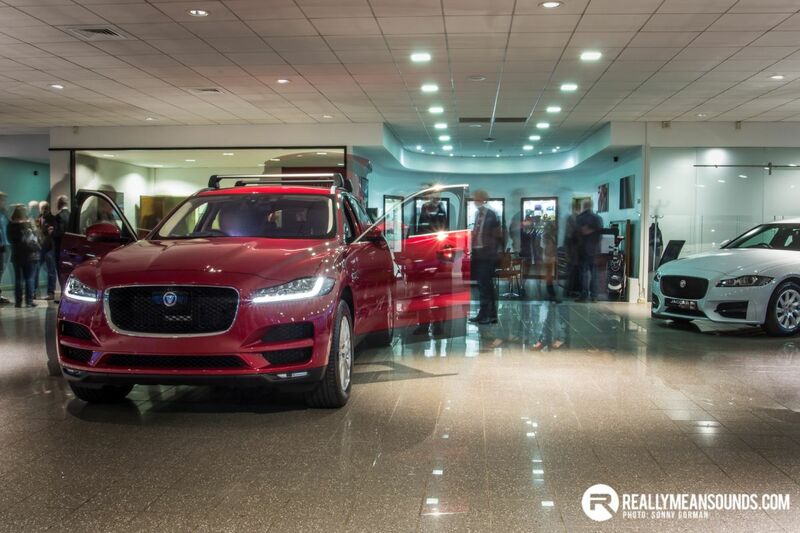 The latest addition to the growing Jaguar lineup is their stunning F-Pace SUV. 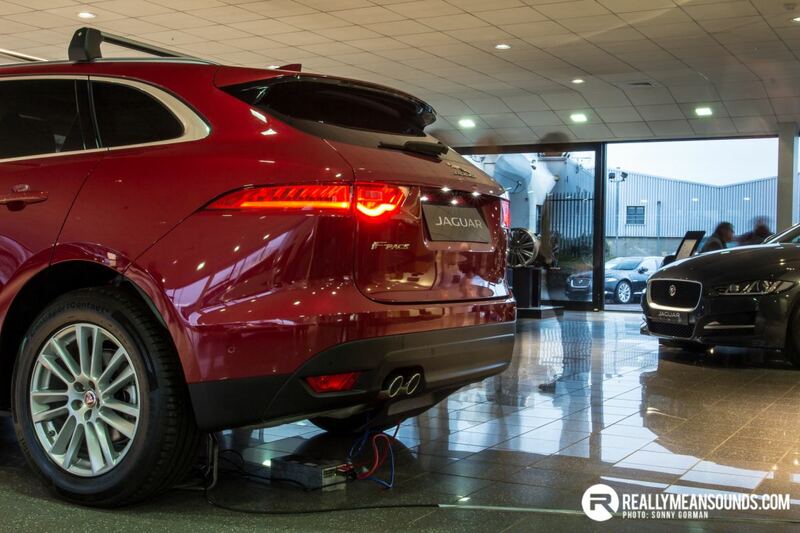 We went along to it’s first unveiling in Northern Ireland, at Charles Hurst Jaguar on the Boucher Road. I first laid eyes on the new F-Pace at Geneva last week and from looks alone I immediately knew it would be a hit in the now massive SUV sector. 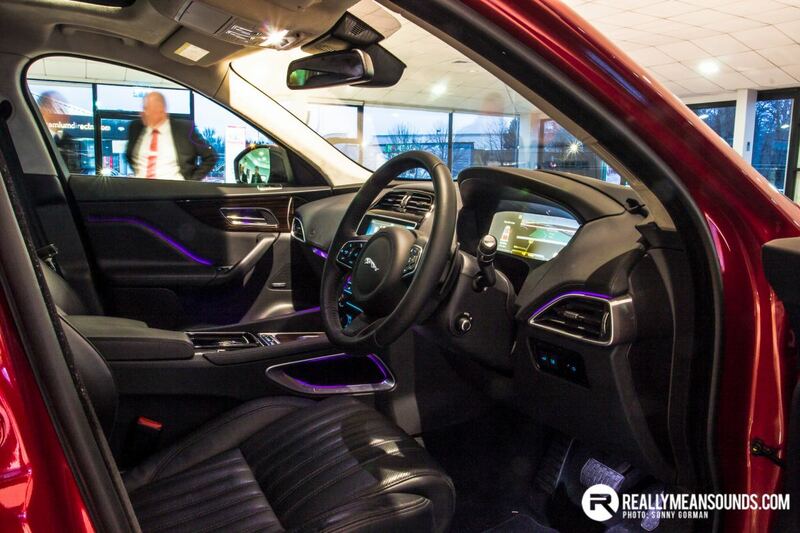 Up close and personal in the showroom, it’s easy to see why. The signature grill and headlights that are served up from the XF and XJ lineage is unmistakeably Jaguar, and at the rear the tail lights remind me of the gorgeous F-type. It’s aggressive stance continues in profile – the wheel arches are enormous, easily swallowing up to the 22″ alloys you can specify when ordering. In the looks department at least, it’s right up their with the Range Rover Evoque. It’s based on the XF floorpan so there’s no Range Rover platform crossover here, with a mostly aluminium body weighing in around the 1.8 ton mark. It’s longer than say, a BMW X3 but shorter than a Range Rover Sport and this translates into both a decently sized passenger compartment and load space in the rear. For those Q3 and Evoque owners who feel cramped this is particularly appealing. The Jaguar F-Pace also shares engines with the XF and XE cars, with a choice of 2.0 4Cyl diesel (178bhp), 3.0 6cyl diesel (296bhp) or quite interestingly for an SUV, a supercharged 3.0 petrol (375bhp). You can actually buy a rear-wheel drive version, and I’m informed that like BMW, their 4wd will have a rear wheel drive bias claiming best in class driving experience. Inside and this model was awash with stitched leather and wood inserts. Standards here better Audi and in this 8 speed auto model, sport the same stick free centre console. The dash is all screen, button count is low and no doubt would be a pleasant place to sit for long journeys. Choice can sometimes be a bad thing and this is where I think Jaguar stand out. The showroom has half a dozen models, all in or around the top of their respective classes. If I was in the market for an SUV and went to BMW, I’d have an X1, X3, X4, X5 or X6 to contend with and variations thereof. Audi aren’t far behind with the Q2 due soon. Jaguar have a cracking proposition in the new F-Pace and haven’t the need to dilute their range with 10 similar variants. It’s just a shame that in releasing this SUV that the equally stunning XF Sportbrake is no more. 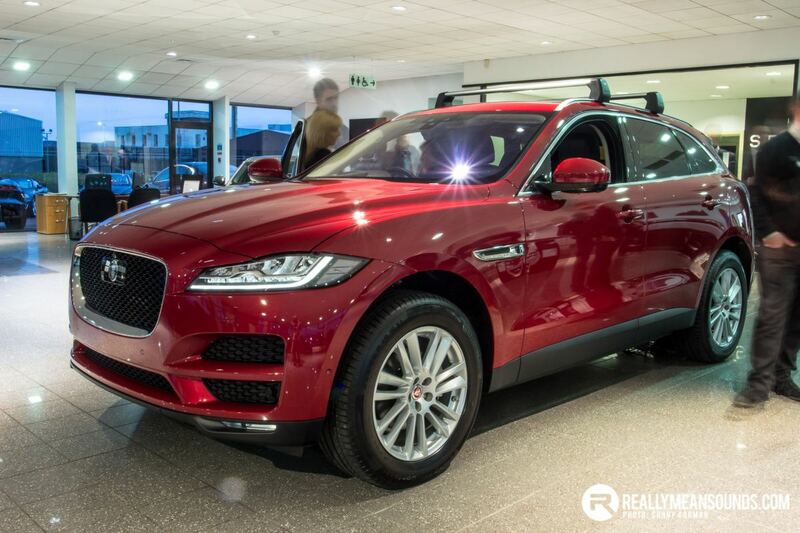 I can understand why demand is strong for the new Jaguar F-Pace. It has all the right credentials to make it fantastic on the road and we are looking forward to testing it on Northern Ireland roads very soon. Prices start from £34k for the 4cyl diesel up to £51k for the 6 cylinder cars. Nice looking, I am waiting to see what the new Maserati Levante looks like. | Nice looking, I am waiting to see what the new Maserati Levante looks like. Like a Quattroporte shagged a Cayenne. | Like a Quattroporte shagged a Cayenne. I think in the white it looks great, waiting to see one in the metal. CH want me to place a deposit to secure one of the first ones but the UK are only getting diesels. It is a very nice looking SUV, if not exactly breaking the mould. Very much in the vein of Cayenne, Toureag and Q7. Sensible enough pricing however i have found the Jaguar stuff to be pretty hefty on the wallet once you start to spec them.